In the rolling hills south western Uganda covered with moist dense and tall forest ecosystem, there lies the close to a half of what have grown in popularity to become the species of concern world over in the contemporary era named the mountain gorillas that have in turn formed a rich ground for Uganda gorilla trekking safaris. In the middle of the 20th Century, it was feared world over that these Species would face the worst of themselves that is extinction following the trends of historical dinosaurs that are no more. The increased loss of habitat, the war strife, sport hunting and poaching was among the main catalysts that would see this presumption become a reality and as a result gorilla safaris to Uganda would be no more. The mountain gorilla extinction would be among the most unfortunate things that the world would have witnessed. For like the dinosaurs which spread widely, the gorillas which are descendants of the Old world monkey are noted to have spread widely in the dense tropical forests of Africa before they were disintegrated by the last ice age and the section that would evolve into mountain gorilla Species followed to east to the mountains of Virunga and the Bwindi. Their fate was halted by the arousal of the international community awareness that the mountain gorillas were heading to destruction. A range of efforts were put in place spearheaded by great research, habituation, gazettion and anti-poaching measures that saw the mountain gorilla populations rejuvenate. It is now a remarkable and a rewarding moment that travelers on gorilla safaris in Uganda can comfortably an assuredly explore these ancient apes in their natural habitat. The mountain gorilla would appear with dense fur, no tail, four powerful limbs and the chest which make them the most powerful of all apes, human like face and if it is a mature male with a silver patch on its back. Living in families just like their human cousins, the mountain gorilla family features a silver-back which accords you a warm welcome or an aggressive one depending on the prevailing circumstances. 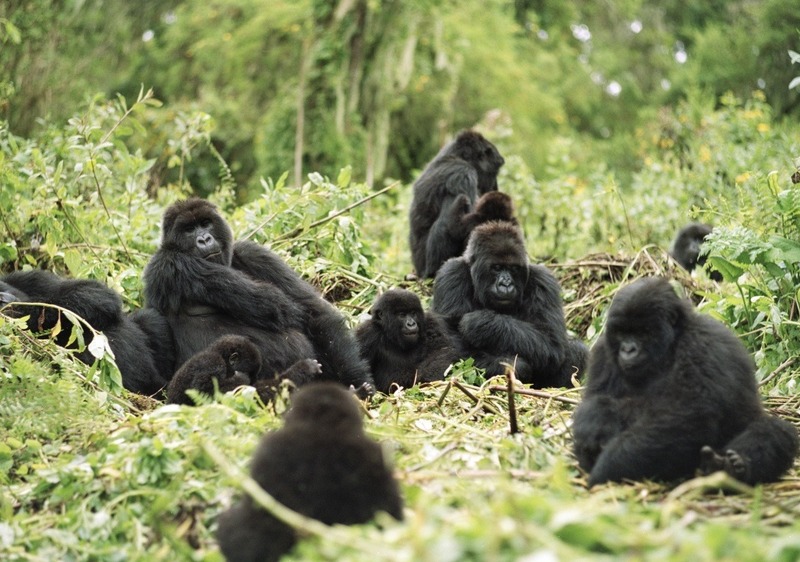 The moment that one spends with the mountain gorillas is a wonder of a life time. Their frightening eyes perched on a shy face and the body movements and the plays of the young stick with you creating a life time memory that you will always refer to in periods far from the date of tracking. The sights of the gigantic males along with the moderate females, the young gorillas hanging on tree branches and playing around with their mothers and the entire group drumming up and rummaging for the delicious food derive exciting moments. Free to take photos provided the flash is off. The encounter with the mountain gorillas in Uganda can be explored in Bwindi Impenetrable National Park along with the Mgahinga Gorilla National Park all in the south west of Uganda. Bwindi Park alone supports a minimum of 400 mountain gorillas and a range of 12 twelve groups are already habituated for gorilla trekking in Uganda and more two are undergoing habituation. Mgahinga features one habituated family.